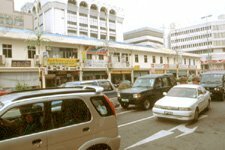 A lot of readers seemed to enjoy the recent blog on Brunei Road Names. I have dug out my 'Road Map and Street Index of Brunei Darussalam' published by Brunei Shell with the Brunei Surveyor General and having to relook at all the road names all over again. The book is a little bit old but still worthwhile to look at. It is the only one there is anyway. So it's not as if you have too many choices about it. One of the feature I love in Brunei is the changing names of the same road you travel on without you realising it. I asked in my previous blog as to when does Jalan Haji Basir end, Jalan Kumbang Pasang begins and ends, Jalan Berakas begins and ends, Jalan Pasir Berakas begins and ends. Jalan Haji Basir started at the top of the road from the Bandar Fire Station along Pusar Ulak/St Andrews and at the four way junction, if you go straight you will be on Jalan Kumbang Pasang and this goes on despite several traffic lights in between all the way to the entrance of the Old Airport goverment complex. There Jalan Berakas begins and it goes on all the way to the roundabout to the airport. If you go straight (you have to go round the roundabout to go across), you will be on Jalan Pasir Berakas. Here's the interesting bit. Jalan Pasir Berakas now only exist on land titles but the official road name label says Jalan Berakas. Someone made a mistake sometime in the past and the 'new' name remain. At the traffic light junction, if you go straight to the Lambak Kanan area, you are actually on an unamed road officially. It is called the berakas link road, linking that area to the highway. If you turned left at the traffic light, you remain on Jalan Pasir Berakas until you reach the Berakas Camp where the road again changes name to become Jalan Pasir. One of the longest roads, if not the longest road in Brunei is the road from Bandar Seri Begawan to Tutong and to Kuala Belait. This road also changes names several times. Most people would just call it Jalan Tutong, except that it's not Jalan Tutong all the way. Supposing you start from Mile 0 (outside the General Post Office in the capital). You are still on Jalan Sultan and Jalan Tutong only starts at the intersection of Jalan Stoney. Then you travel for about 15 miles or so until you reach Sengkurong. Briefly Jalan Tutong becomes officially Jalan Sengkurong before becoming Jalan Tutong again at about the petrol station at Sengkurong. Then it's Jalan Tutong all the way to Tutong and when you reach Tutong Town itself, it changes name to Jalan Enche Awang. At the junction to the Highway, you have a choice of going straight through and joining Jalan Kuala Tutong. Same road for about 30 odd miles but that road has several names. I supposed it does not really matter but it is quirky and feels as if someone somewhere who is in charge of road names could not care less what happens to the names of these roads. But that is the character of the road and road names in Brunei.